A fire at a collapsed factory building in Bangladesh's capital Dhaka has hampered efforts to reach remaining survivors of a disaster that has killed at least 377 people. The fire was started by sparks from cutters being used in a failed attempt to free a female survivor. 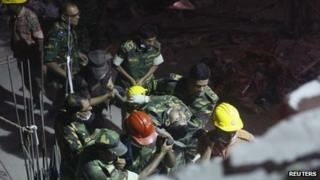 It was extinguished late on Sunday, and work with heavy lifting equipment has now resumed at the Rana Plaza factory. Owner Mohammed Sohel Rana was earlier arrested near the Indian border. He has been flown back to Dhaka. Mr Rana was said to have been in hiding since the eight-storey building collapsed on Wednesday with hundreds of workers inside. Smoke was seen pouring from a section of the third floor of the building on Sunday afternoon, stopping rescue work in that area, although efforts continued in other parts. The Rana Plaza in Savar, on the outskirts of Dhaka, was a garment factory and the presence of clothing may have worsened the blaze, correspondents say. The BBC's Anbarasan Ethirajan says rescuers had been trying to free a trapped woman for a number of hours but they later reported she had not survived. Cutters and heavy lifting equipment had been brought in after officials determined that light equipment could no longer do the job. Earlier on Sunday, two people were pulled out alive but hopes are fading that many more survivors will be found. The co-ordinator of rescue efforts said that work with heavy-lifting gear would be done carefully to avoid mutilating bodies trapped under the debris. Thousands of relatives of missing workers are still waiting at the site as survivors and the dead are pulled from the rubble. At least 3,000 are estimated to have been in the building when it collapsed. About 2,430 are now known to have survived. There is no official figure on the number of people still missing, but Akram Hossain, a deputy director of the fire service, said their chances of survival were "diminishing by the minute". Earlier, local government minister Jahangir Kabir Nanak announced the arrest of Mohammed Sohel Rana by loudspeaker at the site of the collapse, to cheers from rescue workers. Oh Allah! How am I going to feed and raise my daughters? The factory owner was detained near the land-crossing in Benapole along the border with India's West Bengal state by Rapid Action Battalion soldiers. Bangladeshi TV later showed Mr Rana in handcuffs after being flown back to Dhaka by helicopter. The building housed several garment factories. Six people, including three factory owners and two engineers, have now been arrested. Anger at the building collapse has triggered days of violent protests in Dhaka. On Sunday, garment workers blockaded a main road in a nearby industrial zone of Gazipur demanding capital punishment for those responsible. Bangladesh has one of the largest garment industries in the world, providing cheap clothing for major Western retailers that benefit from its widespread low-cost labour. But the industry has been widely criticised for its low pay and limited rights given to workers and for the often dangerous working conditions in garment factories.